Tempers fray after James Bowen goes down following a coming together with Jonathan Wafula. 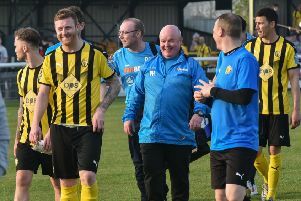 Brakes survived a torrid opening and the sending-off of Callum Gittings to make it four Conference North points in as many days, writes Paul Okey. Ahmed Obeng made way for Connor Taylor in the only change from Saturday’s draw at Altrincham and the former Tamworth midfielder played a crucial role in Brakes 15th-minute opener. However, the goal, scored by Matty Stenson, was completely against the run of play after wave after wave of Boston attacks had threatened to swamp the home side. The visitors, looking to exploit space on Brakes’ right flank, saw Adam Marriott fire into the side netting after springing the offside trap and the striker then turned provider, laying the ball back for Jonny Mareltis to drag a shot wide of the far post. An Andi Thanoj piledriver ricochetted off Marriott and narrowly past the near post with Tony Breeden wrong-footed and Marriott then cut inside two players before directing his shot straight at the home skipper. Brakes were coughing up possession with alarming regularity but the one time they took care of the ball they fashioned a goal. Taylor earned himself time in midfield and sent in a deft ball which picked out the run of Stenson. The striker’s header looked too close to George Willis but the Boston keeper could only parry it towards goal, with the ball trickling over the line despite the attentions of a backtracking defender. The goal knocked Boston out of their stride and Willis had to be alert to collect a Taylor header after Junior English had done well to get a cross in. A stoppage for an injury to Connor Gudger allowed both side to take fluids on board and the disjointed nature of the game continued to the break, much to the frustration of the visitors. English was in the right place to bravely block a Nathan Arnold strike in the 40th minute and Gudger was eventually replaced by James Bowen who was straight into the action after being fended off by Jonathan Wafula as the two jostled ahead of a throw-in, falling to the ground holding his face. Both teams were quick to get involved in the ensuing melee and when order was restored, Wafula was shown a yellow card which could quickly have become red when he went down theatrically inside the Leamington box after seemingly escaping the clutches of his two markers. However, referee Barry Lamb chose not to issue any further censure and both teams went in at the break with their full quota. Wafula again proved a central figure in the first action of the second half, prodding over the bar from close range after the home side had failed to deal with a corner. Kieran Dunbar was then unlucky to see his rising drive go straight into the arms of Willis after a deft first touch had allowed him to latch on to Jack Edwards’ flick-on. A Boston counter came to nothing but a foul on Thanoj in the build-up earned Gittings a yellow card which was to prove costly less than a minute later. The Brakes midfielder clearly took exception to a challenge by Thanoj and threw the defender to the ground, with referee Lamb only picking up on the throw and dishing out a second yellow and then a red to Gittings. Marriott dragged a shot wide from distance as the visitors tried to make the most of their numerical advantage but, playing down the slope, they resorted to long balls which were proving meat and drink to Breeden. Obeng was brought on in the 69th minute in place of Taylor as Brakes looked to stretch the game and two minutes later they had doubled their advantage. English challenged for a corner from the right and when he and the ball landed he swivelled to smash it home from eight yards out, picking up a knock in the process. Boston still believed they could find a way back into the game and Wafula was probably wishing he had seen red in the first half after powering the ball over the bar from no more than three yards out following a left-wing corner. He chose to head the ball into the path of Ryan Qualter the next time he was under the flight of a high ball and this time it was the Boston midfielder who was cursing after hooking the ball tamely over the bar from eight yards. Stenson flicked a header wide at the other end as Brakes sought a further cushion, while Ben Middleton was well off target with a header for the Pilgrims. Patient play from the visitors worked an opening for Marriott whose shot took a deflection on the way out , the same player then heading into stand from the second of the resultant corners. Stenson’s tireless shift was over in the 86th minute with Joe Magunda introduced as Paul Holleran looked to hang on to what he had got. However, it could have been 3-0 just a minute later, with Willis springing theatrically to his left to hang on to a deflected Dunbar effort. Boston had one last opportunity to get on the scoresheet when they were awarded a free-kick in a central position in the third of four minutes of injury time but despite Thanoj’s strike beating the wall it was straight at Breeden.